Comm Eye Health Vol. 19 No. 59 2006 pp 46-47. Published online 01 September 2006. Ophthalmologist, Bawku Presbyterian Hospital, Bawku, Upper East Region, Ghana. Ghana is a west African country bordered on the south by the Atlantic Ocean, and the north, east, and west by the Republics of Burkina Faso, Togo, and Ivory Coast respectively. It has a population of 20,771,382. Prevalence of blindness is estimated at one per cent. It currently has 52 ophthalmologists and 216 ophthalmic nurses (National Eye Care Secretariat), with nearly half of the ophthalmologists (19) located in the national capital and its environs. The health sector attracted 7.9 per cent of government budget in 2002 and 12.3 per cent in the 2006 budget. Currently there is a comprehensive national health insurance policy being implemented that covers most of the common eye operations done in the country. Part of the success derives from the motivated team work in the programme. GHANA. © Bawku Hospital Eye Unit. 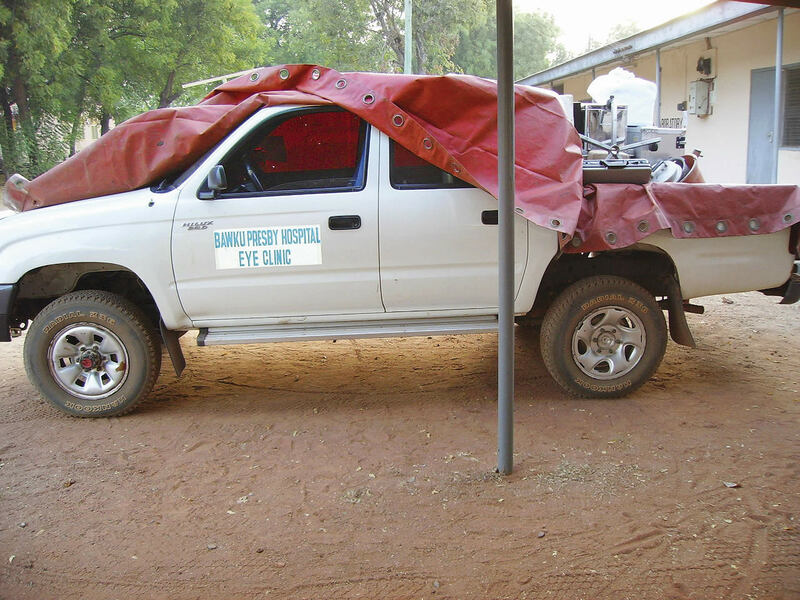 Outreach vehicle preparing to travel to those far from eye care facilities. GHANA. © Bawku Hospital Eye Unit. Bawku is located in the Upper East Region. Its population is 961,000, and it is the poorest region in Ghana. Its eye care services, however, are among the best. The regional eye care programme is largely a hospital-based programme that started some thirty years ago with the help of the Christoffel Blindenmission. Based at the Bawku Presbyterian Hospital, the programme has grown to become a de facto regional programme with extensive outreach services across the region and beyond, into the neighbouring Northern Region, Burkina Faso and Togo. development of a sustainable programme with progressive reduction in dependency on donor funding. The commonest causes of blindness and visual impairment in the region are cataract, glaucoma, and uncorrected refractive errors. With the near absence of trachoma and onchocerciasis, the focus of our interventions is on eliminating visual impairment and blindness from cataract and refractive errors, reducing visual loss from glaucoma, and provision of low vision services. a cataract surgeon to support the ophthalmologists and nurses to give ocular anaesthetic. The target in our cataract services is to attain a surgical output above our national VISION 2020 cataract surgical rate (CSR) target of 2,500. Figure 2 shows the CSR of the various regions. advocacy to include glaucoma surgery in the ‘minimum benefit package’ of the National Health Insurance Scheme in the region. Most causes of childhood blindness in the region are avoidable. Eye health education and vitamin A supplementation are delivered as part of the Expanded Programme on Immunisation (EPI) through inter-sectoral collaboration with the Ghana Health Service, while school eye health programmes are organised in collaboration with the Ghana Education Service. Surgically avoidable cases of childhood blindness are managed here and, where necessary, referred to the paediatric ophthalmic unit at the Korle-Bu Teaching Hospital in Accra. With only one optometrist in the region (in private practice), the bulk of refraction and low vision services are rendered by an ophthalmic nurse/refractionist. Currently, all ophthalmic nurse trainees at the hospital receive tutorials in basic refraction. In this way basic refraction services are expected to become progressively available at the district and community levels. There are 20 ophthalmic nurses (one per 45,000 population), two ophthalmologists and a cataract surgeon, two refractionists and a cadre of primary eye care (PEC) workers who have been trained and deployed in the various communities under the community-based rehabilitation (CBR) projects. Nurses learn proficient use of the slit lamp and its accessories, indirect ophthalmoscopy, retinoscopy, and use of many basic tools that are considered the privilege of the ophthalmologist in many hospitals in the country. In this way, the nurses can competently handle routine pre-operative and post-operative management of uncomplicated cataract cases. They are also trained to give ocular anaesthetic and do common operations like cicatricial entropion repairs, pterygium excision, evisceration, etc. This enhanced role constitutes a source of pride and motivation, while allowing the doctors time to do the more complex operations and laser treatments. Fellowship training under the West African College of Surgeons programme normally takes about six years to complete as a general ophthalmologist. In Ghana, only five ophthalmologists have been trained under the programme over the last twenty or so years, with most spending nearly ten years in residency. While the two-year diploma programme seems too short, the current fellowship programme appears rather too long for the available technology in the sub-region at the moment. Perhaps the east African system of three years is a better compromise and should be encouraged. These should be an integral part of all the regional programmes. The programmes should be resourced adequately to undertake these and overcome geographical and other related barriers to service uptake. This, from my experience, is a major step towards increasing surgical output. In many hospitals, the work of the ophthalmic nurse is limited to recording visual acuity and assisting the ophthalmologist. Most ophthalmic nurses can be educated to manage all routine post-operative cataract patients, give ocular anaesthetic and do minor operations. In the out-patients department, they can handle many more patients than we currently expect of them. More time would be made available for the ophthalmologist to perform operations. These measures may sound controversial, but the reality is that they are possible and have been implemented successfully elsewhere. What we need is a focused education programme, supervision, and quality-control assurance. CBR workers and community volunteers can readily be trained to diagnose and refer cataract patients to district hospitals. In addition, primary eye care should be made an integral part of community health training so that this cadre of nurse, available in all districts in Ghana, can play a meaningful role in eye care. 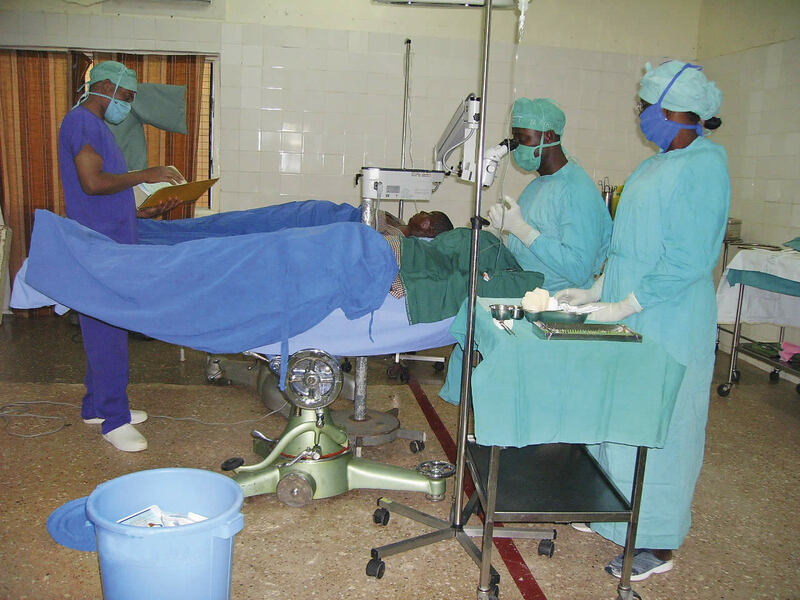 Cataract surgeons are still neither recognised nor accepted in Ghana, despite overwhelming evidence of their importance in many African countries.3 On the contrary, general medical assistants (one-year post basic nursing) are trained and posted to district hospitals to manage a wide range of medical conditions. My personal experience with cataract surgeons in the Gambia and elsewhere is that they are perfectly up to the task; revisiting this issue is more important now than ever, if we are to realise our stated goal of eliminating all causes of avoidable blindness by the year 2020. 1 Ntim Amponsah CT, Amoaku WM, Ofosu-Amaah S, et. al. Prevalence of glaucoma in an African population. Eye 2004;18: 491-497. 2 Verrey JD, Foster A, Wormald R, Akuamoah C. Chronic glaucoma in northern Ghana – a retrospective study of 397 patients. Eye 1990;4: 115-120. 3 Karimurio J. African Programme: Kenya. J Comm Eye Health 2000;13: 49-64.